The Isle of Wight Area Group was set up in 2010. 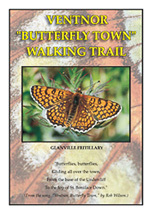 We organise public walks to show people where to look for butterflies and how to identify them and a few moth-trapping events suitable for beginners and experts alike. In 2012, we will start some organised monitoring of scarcer Isle of Wight species so that the information can be used to assist their conservation. Any records you make and send in on your own will be much appreciated as there are many parts of the IOW that need better coverage. 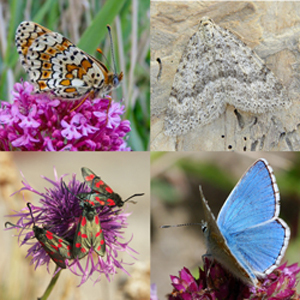 Please send butterfly records to Paul Brock or add them to the Hampshire and Isle of Wight sightings pages. Moth records should be sent to Tim Norriss or Mike Wall. The Isle of Wight is the largest island in England. It is roughly diamond-shaped and is 23.5 miles (37 km) long east-west and 13.5 miles (22.5 km) wide north-south. The IOW has an area of almost 150 sq. miles (380 sq. km) and 60 miles (98 km) of coastline. It is separated from Hampshire by a stretch of water called the Solent, which is approximately 30 miles long and 2-5 miles (5-8 km) wide. The IOW has a population of around 140,500 (2010 data), most of which is concentrated in the centre, north and east of the Island. The county town is Newport, towards the centre. The other main towns of Ryde, Cowes, East Cowes, Sandown, Shanklin and Ventnor are all on the coast. Western and southern parts of the IOW are more rural, with one small town (Yarmouth), villages (the largest being Freshwater), hamlets and farmsteads. The National Trust looks after 10% of the land and 51% of the land is within the Isle of Wight Area of Outstanding Natural Beauty. The ferry ports are at Yarmouth (passenger and car), Cowes (passenger only), East Cowes (passenger and car), Fishbourne (passenger and car) and Ryde (passenger only). The bus service is run by Southern Vectis and buses run frequently in the summer between the towns but some rural areas are poorly covered. A train service, operated by Island Line Trains (part of South West Trains), runs between Ryde Pier Head and Shanklin. See below for further details. The IOW has a good network of public footpaths. See the WightCam website for more information and their Rights of Way Map. The IOW has one of the best records for sunshine in the south of England and is warmer than many other places in the UK because of its southerly location and prevailing south-westerly winds. Some areas are sheltered by high cliffs, for example Ventnor in the south-east, which is renowned for its warm microclimate. 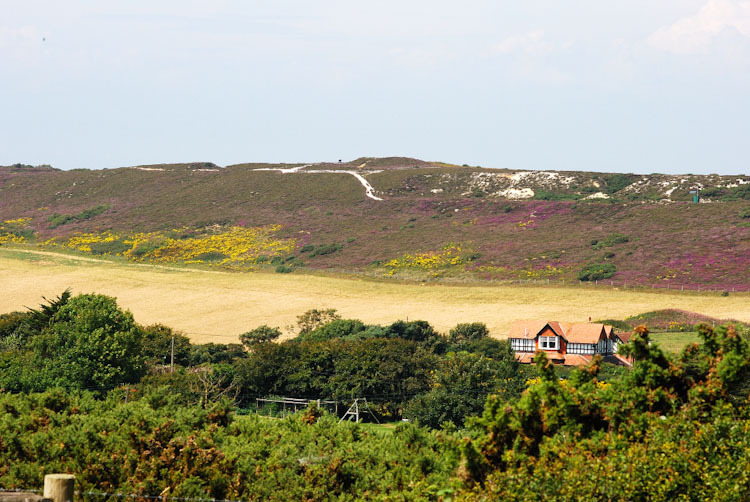 Despite the relatively small land area of the IOW, the weather can vary quite dramatically from one place to another; this is largely due to maritime and geographical influences. Coastal areas are prone to sea fog through the spring and early summer. This may linger through the early morning until the sun burns it off. 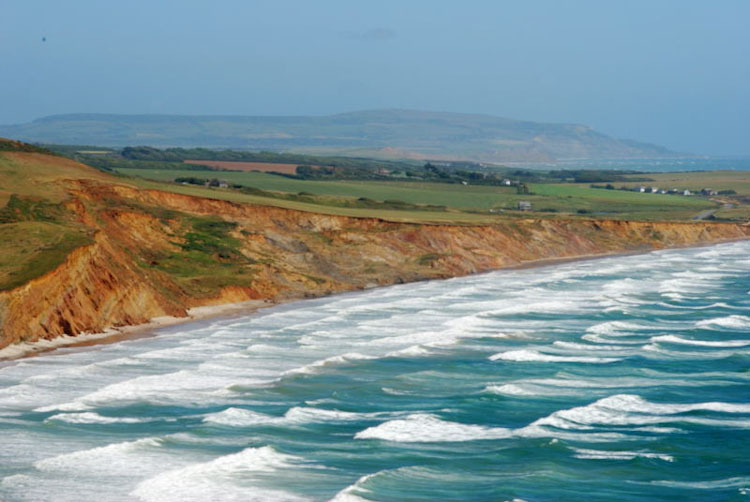 The IOW is characterised by a great variety of geology and landscape. A central chalk ridge runs east-west across the Island and there is a second block of chalk downland in south-east Wight. St Boniface Down is part of this second block and at 241 m is the highest point on the Island. Lower-lying clays, limestones and gravels occur to the north of the central chalk ridge, with Greensand and Wealden deposits to the south. High cliffs form where the chalk ridge meets the sea at either end of the IOW - at White Cliff Bay and Culver Down in the east, and between the Needles and Compton in the west. The chalk downland above the cliffs supports an abundance of wildflowers and good populations of chalk-loving butterflies and moths (see under 'Chalk downland', below). The southern coast in particular is vulnerable to storms crossing the Atlantic and rates of erosion are particularly rapid along the south-west coast of the Island. The eroding soft sand and clay cliffs of the southern coast between Compton and St Catherine's Point slump down to the sea to form an ever-changing series of grassy terraces or undercliffs. This is one of the main breeding areas of the Glanville Fritillary and Wall. At intervals along this coastline, small streams cut narrow ravines in the soft strata and these are further eroded by the wind to form what are locally known as 'chines'. Chines have rough vegetation and steep sides and provide valuable shelter for plants and animals, including butterflies and moths, living in exposed coastal areas. From Niton to Ventnor, huge landslides of harder rocks over softer clay have occurred in the more distant past. The undercliffs so formed are more stable than those in the south-west of the IOW and have been built on, as at Ventnor. The coastal area between Niton and Ventnor is called 'the Undercliff' and that east of Ventnor to Bonchurch as 'the Landslip'. These undercliffs are exposed to the sun and protected from the cold northerly wind by the inner cliff and have a Mediterranean-type climate. They provide ideal conditions for butterflies of coastal habitats, including the Glanville Fritillary, Wall and Clouded Yellow. The north shore of the IOW is composed mainly of soft and slumping clay cliffs and sheltered estuarine creeks and harbours. The northern shore is more sheltered than the southern coast and erosion is not as rapid. 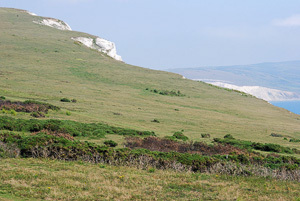 The unimproved downland of the central chalk ridge and the outlying block in the south-east of the IOW support good colonies of Adonis, Chalkhill, Small and Common Blues as well as localised colonies of Brown Argus, Dark Green Fritillary, Grizzled and Dingy Skippers and Green Hairstreak. Abandoned chalk quarries provide sheltered butterfly havens, as at Afton Down and Brook Down. 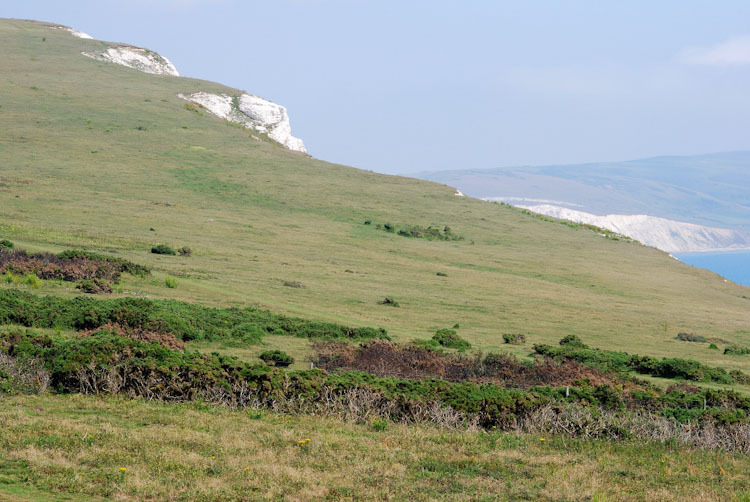 Brook Down is well worth visiting for Adonis and Chalkhill Blues and Dark Green Fritillaries, hundreds of Chalkhill Blues can be seen on Tennyson Down in late July/early August and Brading and Bonchurch Downs also have good colonies of both Chalkhill and Adonis Blues. Most of the woodlands over 1 ha in size are north of the chalk ridge. The mixed woodlands on clay soils in the northern half of the Island hold good colonies of White Admiral, Silver-washed Fritillary and Purple Hairstreak. Examples are Walter's Copse at Newtown (National Trust) and Firestone Copse near Wootton (Forestry Commission). Parkhurst Forest and Firestone Copse are blocks of Forestry Commission woodland with waymarked trails and car parks. The former holds the Island's remaining Pearl-bordered Fritillary colony. The White-letter Hairstreak occurs in the Newtown area (near the main bird hide) and at Parkhurst Forest but needs a lot of patience to find. There is currently only 70 ha of heathland on the Island but a restoration project by the Hampshire & IOW Wildlife Trust is trying to increase the amount, mainly by reclaiming it from forestry, for example at Bouldnor and Brighstone Forest. 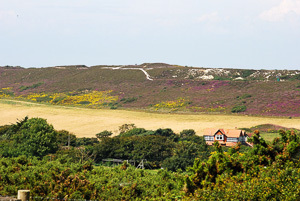 Other areas of heath are found at Headon Warren (between Alum Bay and Totland), at Cranmore and at Bleak Down near Godshill. Ningwood Common, a Hampshire & IOW Wildlife Trust reserve at Cranmore, holds the Island's remaining Small Pearl-bordered Fritillary colony. The Grayling may be seen at Headon Warren and in good numbers at Bleak Down. The Wall may be seen on farmland tracks such as sections of the Hamstead Trail between Brook Bay and Hamstead Point. Newly arrived migrant Clouded Yellow, Small and Large Whites and Painted Lady may be seen nectaring on flowers in wildlife strips around fields and in crops of clover and Lucerne. On warm days with a southerly wind, these migrants can be seen arriving in off the sea and feeding on clifftop flowers before continuing north. Butterflies that can be seen in profusion on the small flower-rich meadows enclosed by dense hedgerows of the north of the Island include Marbled White, Gatekeeper, Meadow Brown and Small Skipper. 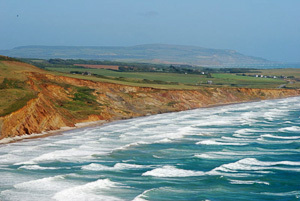 The official site of Isle of Wight tourism can be found at www.islandbreaks.co.uk.